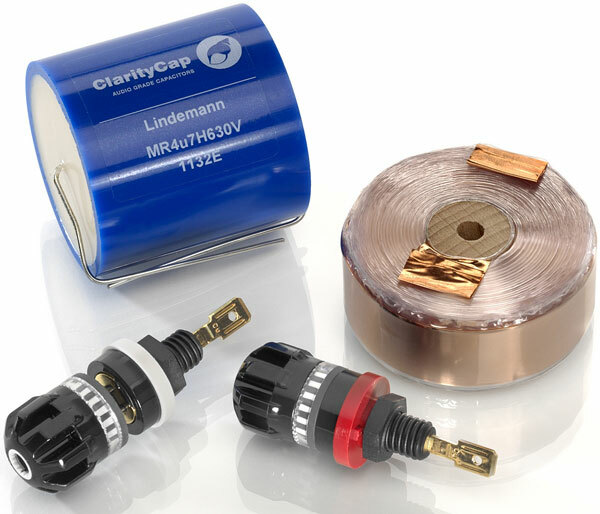 For internal wiring, Lindemann uses the highest purity OFC copper sourced from New Zealand. The wiring is based on Norbert’s preference for multiple twisted pairs of conductors that are not subjected to any surface treatment or plating, which is supposedly ideal for high-speed and low-loss signal transmission. The wire is manufactured in Germany, cryogenically treated and available also in their “Kind of Blue” cable line. One of the BL-10’s design goals was to not have the loudspeaker’s energy drained away into the floor through the conventional method of mass loaded stands with spiked feet. So Lindemann designed their owns stands. There only seems to be one of two reactions to the looks of these stands: “man they are cool”, or “they sure are flimsy and remind me of TV trays of the 50s.” I fall into the man-they-are-cool camp. I think they are sleek and very modern looking. The stands are made from solid stainless steel rods which are attached underneath each mini-monitor with stainless steel screws. The point of contact is metal-to-metal. The bottom of each stainless steel foot is directly coupled to the floor with a “tone-wood” puck separated by a high-tech ceramic ball-bearing, perfect to use on both hardwood flooring and low pile carpeting. I initially plopped these down in the same place as my reference speakers and hooked up my 10-Watt Wavac EC300B but as I expected, this just wasn’t enough power. The good news is that I had some great amps available to me to use with these little German wonders; these included the Atma-Sphere M-60 Mk. 3.1 OTL mono-block amplifiers and the Electrocompaniet ECI-5MKII integrated with 120 watts per channel. Both of these amps produced a prodigious soundstage with incredible scale, width, and depth. Even though I’m a tube lover I thought the best sound came when the BL-10s were paired with the Electrocompaniet. This combination had speed and detail that was truly amazing. I’ll get into more about that later in the review. None of my three favorite speakers work best with the typical audiophile speaker placement, i.e. well out from the front and side walls. The Audio Note E speakers were designed for corner placement, and both the Ikonoklast Model 3 HO and the Teresonic Ingenium MK2 sound best in my room nearer the rear and side walls than most modern speakers’ locations. The BL-10s sound really good almost anywhere I placed them. The very best sound came with them well out into the room and at least 8 feet apart. They sounded best when listened to in the near field with some toe-in. Let’s start with the overall sound of these small wonders. They have simply unbelievable openness, transparency and amazing scale. Instruments come across with vivid color, realistic scale, and placed correctly in the sound field. The sound totally defies their size. It’s hard to not talk about how good these speakers are for their size, but the truth is they are really good among speakers of any size. Well, all of this could also be said about the BL-10, for $6,000 less. Now, admittedly they don’t go as low and aesthetically they are somewhat less impressive, unless you go for their minimal looks. Still, I think if you have a smaller room there are just a few choices, at any price, that offer this level of musical experience.